Is life in Europe better than ours? 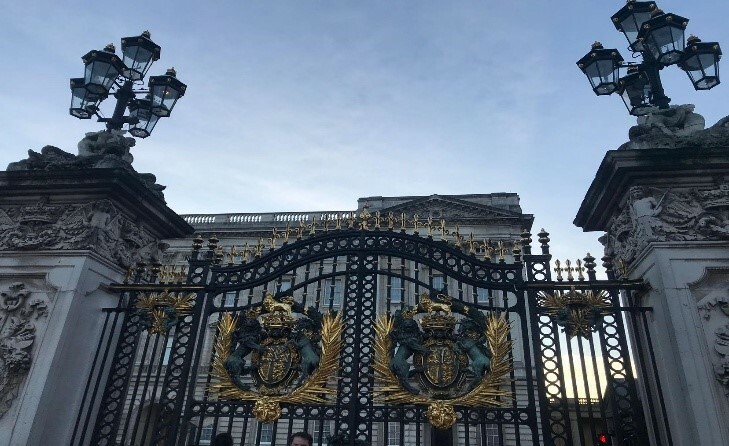 Gates of the Royal Palace in London. During winter break, my family decided to go to London to visit my cousins. My uncle also convinced my parents to go to Paris for a few days before returning back home. With the exception of the dreadful 8-hour flight, I had a lot of fun, although I was surprised to see how different things were in these European countries. The first thing I noticed about London was that the roads are very narrow, especially within neighborhoods. If it was a two-way lane, one car would have to park on one side of the road to let the car coming from the opposite direction pass before the first car is able to continue on its way. All the houses looked alike: small, crowded, and dull. On the first day, my cousin took us to tour the city. In order to get there, we needed to take the tube, or subway. At first, the whole underground system was very overwhelming for me. I struggled to keep up with my family as there were people rushing by like busy bees, pushing and shoving so that they could get to their destination faster. There were about a dozen different subway lines with each leading to another direction in which one could get lost, like a maze. We finally reached our destination and I was fascinated to see how many people were out touring like us. We saw many historical sites, including the Royal Palace, Big Ben, the London Eye, numerous governmental buildings, and more. One of the things I found most impressive about London was its complex public transport system. The tube system was well organized, with signs and maps everywhere, there was no shortage of busses (even on Christmas), and the technological systems of it all was highly advanced. Because literally everyone used public transport, it is very cheap. Tickets only cost £2 ($2.65), teens get a discount, and it is free for children under 12. I travelled for free because I looked that young. My personal favorite was riding the double-decker bus. It was fun to see the city from a higher perspective for a change. I noticed that no one really drove in London since there is always traffic and the roads are so bad; everyone walked. But after just a few hours of walking around, my family was exhausted and wanted to go back home. My legs were sore the rest of the day and I was shocked when my cousin told me she wasn’t tired at all. Even my aunt and uncle were surprised to see us home so early. We went shopping the next day and I surprised on how expensive souvenirs were. One sweatshirt cost £25, about $32! Of course, I bought it anyway. For New Year’s, my other cousin took us to Winter Wonderland, an amusement park only open in the Winter. Luckily, I passed for a 10-year-old, so I got a discount on my ticket. We went on a bunch of rides and had freshly made churros before returning back. As soon as we reached Paris after the three-hour train ride, I was struck with severely cold weather. It was below freezing, although there was no snow. We Floridians decided it was too cold to walk, so we took a taxi. Our driver turned out to be Arab, and when we told him we were originally from Pakistan, his face lit up and said his best friend, Ali, was Pakistani. Coincidentally, my youngest brother’s name is Ali. We talked to him the whole way and he told us we didn’t have to pay him and gave us his number saying if we ever needed a ride to just call him and he would come right away. The first night, we took a bus tour of the whole city at night. It lasted longer because of all the traffic, but the city looked beautiful with all the streets lit up in different colors. The next day, we took the tube to Louvre Museum. It was gigantic; we got lost multiple times. Afterwards, we went to the Eiffel Tower and Notre Dame, which was as fascinating as the stories I’ve been hearing my entire life. We went on a river cruise of the city as well. It was funny because everyone in Paris walks around with a freshly baked baguette in their hand. The stereotypes turned out to be true after all! Both Paris and London are similar in the sense that the population is very diverse, not including the hundreds of tourists. Every block is different, one full of Arab restaurants, one with Asian stores, one with a mainly Jewish community, and more. Everyone is extremely active. I don’t remember seeing a single person overweight, besides those who came from America, wearing San Francisco and New York merch. Another thing I noted is that everyone smokes, even in public places. One of my favorite things about my experience is the accents. Listening to French and British people talk was very amusing; I loved to hear them talk! Finally, for anyone who is interested, Paris had cuter guys than London.